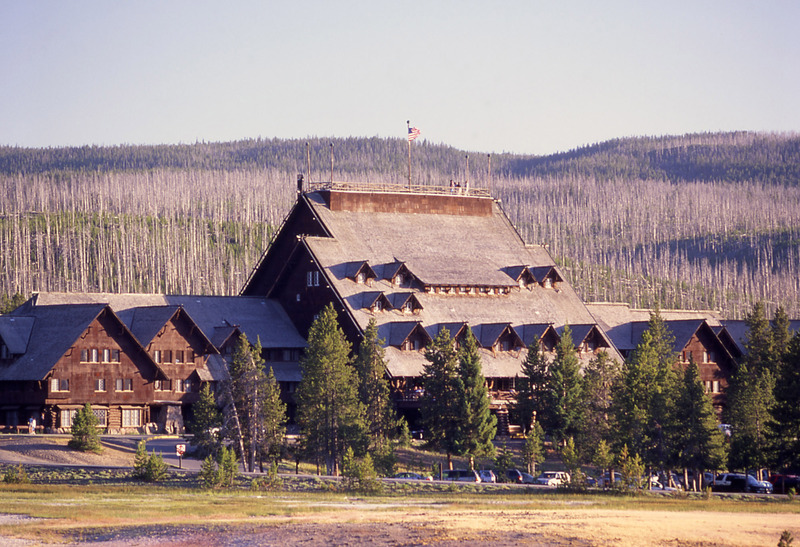 America’s Largest and Most Iconic Log Cabin – The Old Faithful Inn is America’s largest and most iconic log cabin and the first choice for vacationers staying at Yellowstone National Park. For a few hundred dollars, overnight guests can have a front-row seat to the country’s most extraordinary natural phenomenon, at any time of the day or night. The lobby of the Old Faithful Inn is just as breathtaking as it was in 1904, when a young American architect named Robert Reamer designed the hotel to give visitors a remarkable view of the geyser as they pulled up to the door. In fact, the Inn’s covered entrance frames Old Faithful beautifully, making it one of the most recognized settings for Old Faithful photographs. Rustic Beauty – The craftsmanship of the Inn is extraordinary and visitors often say that they feel as though they have bee encompassed by a forest. The hotel is made of indigenous lodge pole pine and towers 70 feet height – the height of an adult lodge pole pine tree. At the top of the inn, Reamer built a tree house, known as “The Crow’s Nest,” where guests could read or watch activities in the Inn’s lobby. As a national historic landmark, Old Faithful Inn is the most requested lodging facility in Yellowstone Park. Visitors today will find three floors surrounding the huge stone fireplace; a hand-crafted clock made of copper, wood and wrought iron; and numerous thick leather chairs where guests can play cards, enjoy a drink, or read. Outside on the second floor, guests can relax, have a drink, and watch Old Faithful from a terrific vantage point. The staff at the Old Faithful Inn is very helpful and friendly, and there are numerous hiking trails that begin at the lodge, including a short loop that circles Old Faithful. Guests also enjoy the staff-led, free hour-long tour of the inn that is offered a few times a day. A Simple Historical Inn – The Inn has 327 rooms, a full-service restaurant, lounge, snack bar, gift shop and daily tours. Suites feature a well-appointed sitting room with a small refrigerator, and a bedroom with two queen beds. Note that this historic inn offers simple wood furnishings, and air-conditioning is not available; however, an open widow will let in a cool burst of fresh air. Guests should request an even-numbered room so that they have a view of Old Faithful, instead of the parking lot. Even if you don’t stay here, you can still enjoy the beautiful architecture by having a meal at the Inn. The dinner buffet is a great value and the service in the restaurant is good. Breakfast muffins, deli, drinks and more are offered at the snack bar, and guests find the second floor outdoor bar generally less busy. 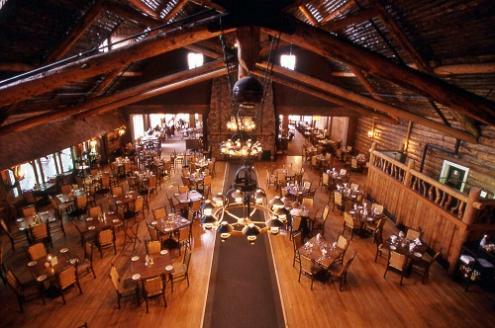 If you want to stay at America’s largest and most iconic log cabin, make your reservation early. Register at least one year in advance, and ask for a second or third floor room where you’ll have a peaceful and inspiring stay.